William A. Taylor, PhD, is associate professor of security studies at Angelo State University in San Angelo, Texas. His published works include Every Citizen a Soldier: The Campaign for Universal Military Training after World War II. Taylor, William. Contemporary Security Issues in Africa. Praeger, 2018. ABC-CLIO, publisher.abc-clio.com/9781440851919. 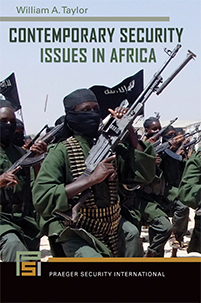 This compelling book serves as a comprehensive resource for readers interested in contemporary security issues in Africa. It details the impact of complex challenges in Africa and explains why addressing them grows increasingly important.